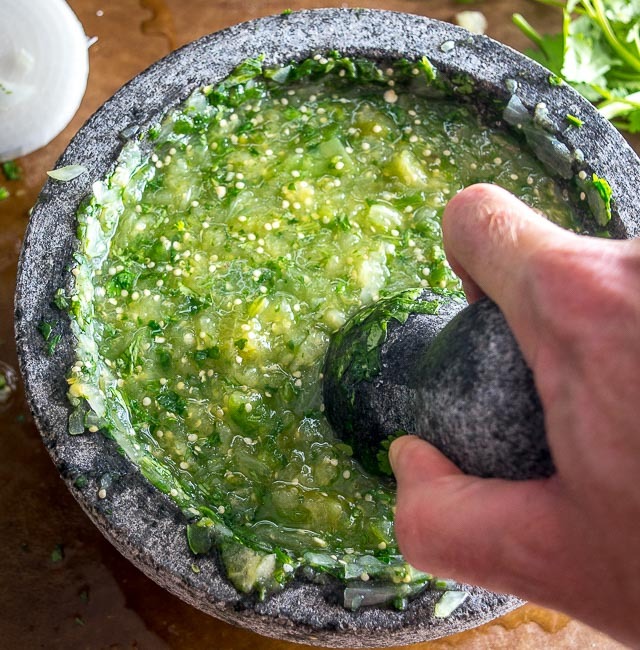 This is probably the easiest way to make Salsa Verde in a molcajete. I’ll put up a recipe soon for a version that chars all the veggies, but this version opts for simplicity by roasting the tomatillos in the oven while you’re smooshing the other ingredients in the molcajete. The flavor you can generate from The Smooshing is unreal and you’ll end up with a vibrant batch of salsa that could potentially cause you to break up with the other salsas in your life. We’re using similar proportions as this salsa verde blender version but we’re adding a couple more tomatillos. You might need less of the other veggies than you would think because the pestle will be pulling so much flavor from them. I used a whole jalapeno for this batch and it ended up with some real zip. If you want a milder version you can start by using half of jalapeno and going from there. You could also use a serrano pepper in place of the jalapeno. First things first, get those tomatillos husked and rinsed. Add them to a roasting pan and put them in a 400F oven for 10-15 minutes. Once they start to turn army green in color they are mostly roasted through. Note that tomatillos typically need less time in the oven than tomatoes. Finely chopping these ingredients will make the process a bit more efficient and help to extract maximum flavor. Keep a spatula on hand to help with crowd control. Eventually, you’ll have a paste-like mixture. 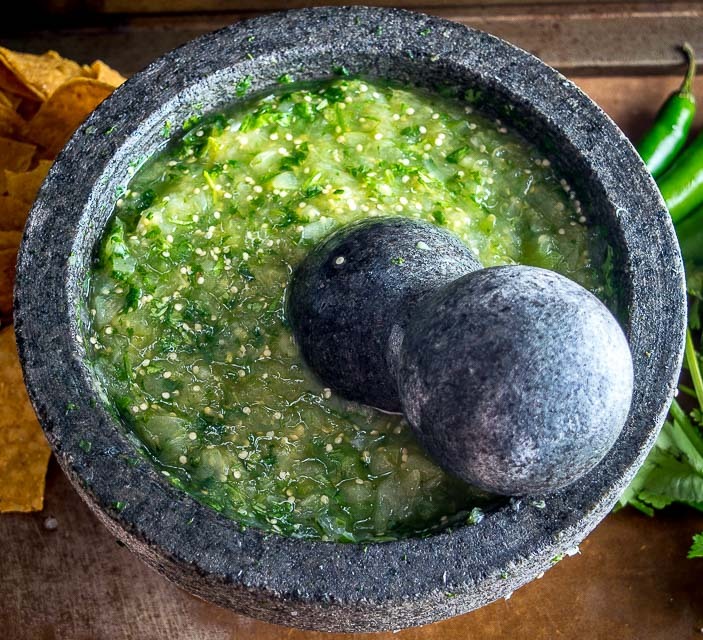 Instead of just plopping the roasted tomatillos into the molcajete, it can be beneficial to chop them up as well. Add these to the molcajete and use a bit of muscle to combine well with the other ingredients. It might take a couple minutes to get a uniform mixture. It’s up to you if you want to label this effort as your exercise for the day. And now take a taste! I rarely add much salt to Salsa Verde so the initial pinch was all it took for this batch. And I was happy with the heat level from the single jalapeno. You can always chop up a bit more jalapeno and crush it into the mixture for some added heat. 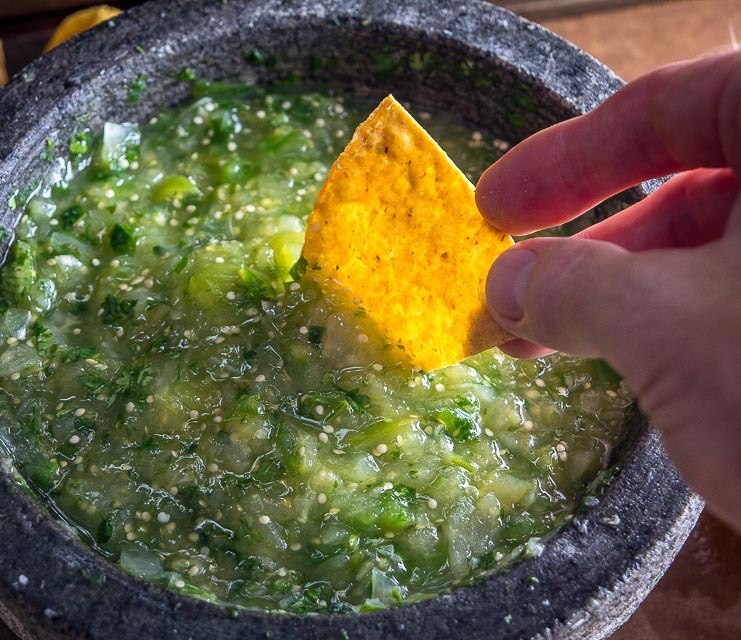 Most likely you’ve now got an authentic Salsa Verde on your hands that’s bursting with flavor. Which will lead to big salsa decisions in the future. To molcajete or not to molcajete? 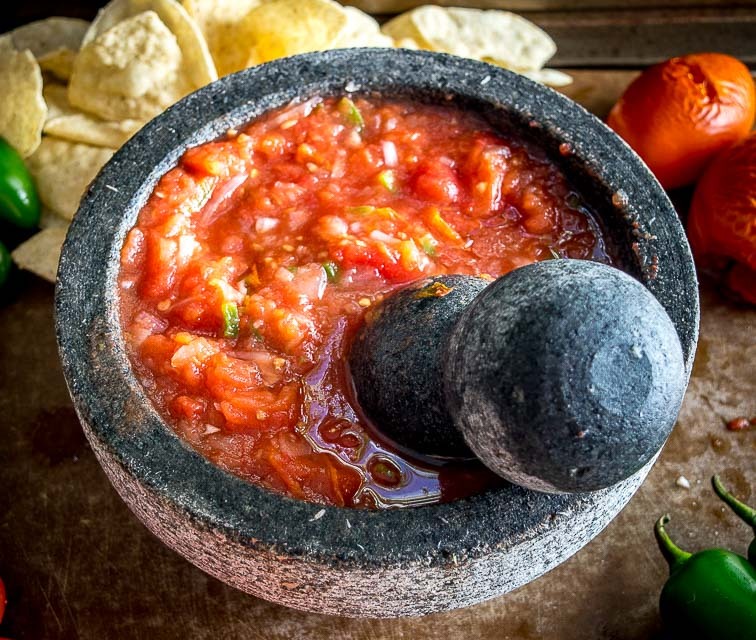 I don’t always use the molcajete as the blender version works just fine when the salsa is a supporting player in the dish. 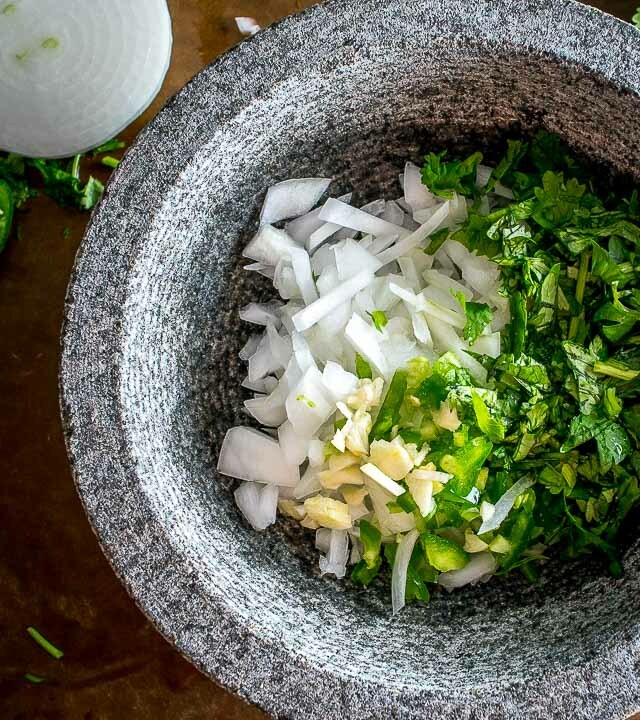 But when the salsa is the main focus, or when entertaining Salsa Rookies, or when you think you deserve something special, then this molcajete version is the perfect candidate. There are a few more details on the specifics of molcajetes in this post, or you can always send me an email if you have any questions. The flavor you can generate by smooshing ingredients in a molcajete is unreal. 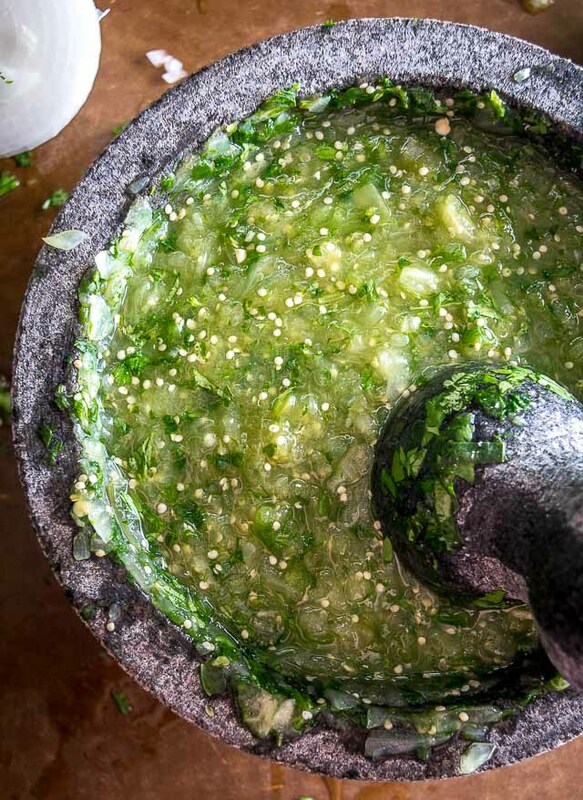 You'll end up with a vibrant batch of Salsa Verde that might become your new favorite! Pull the husks off the tomatillos and give them a good rinse. I usually cut the stems out but this is optional. Roast the tomatillos in a 400F oven for 10-15 minutes or until they start to turn army green in color. Finely chop 1/2 onion, 1 jalapeno (or less), 2 cloves garlic, and 15-20 sprigs of cilantro. 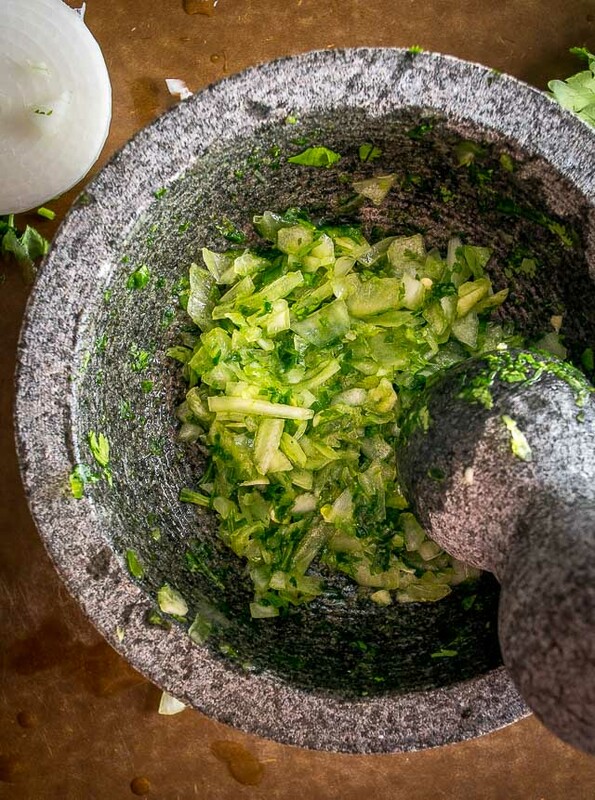 Add these ingredients to the molcajete along with a pinch of salt and crush them into a paste-like substance. 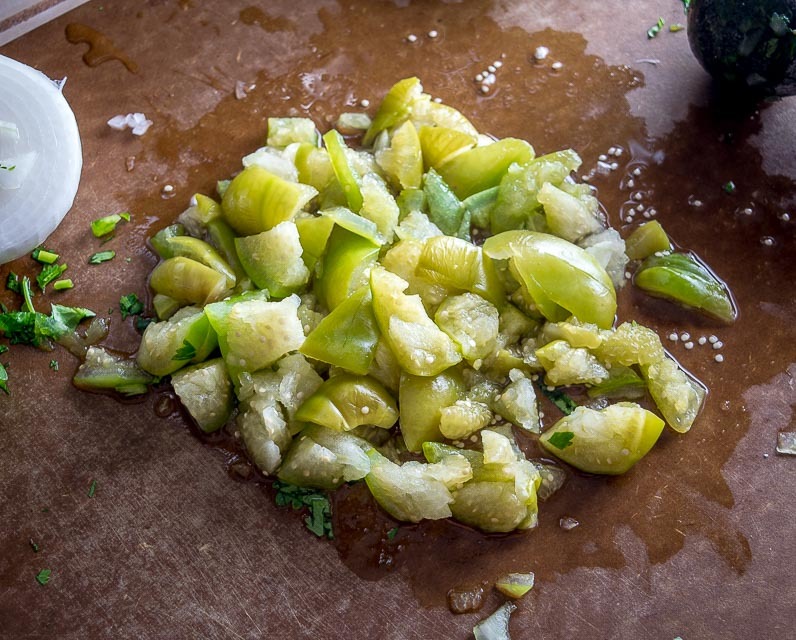 Finely chop the roasted tomatillos and combine thoroughly with the other ingredients in the molcajete. Taste for seasoning. You can add more chopped jalapeno if you want to raise the heat level. Serve immediately. Store leftovers in an airtight container in the fridge where it will keep for a few days. In Mexican cuisine it's common to use the upper portion of the cilantro stems. I typically twist off the bottom, thicker portions and discard them, keeping the upper portion of the stem that holds the leaves. Be sure to give the cilantro a good rinse. If you want a milder salsa I would recommend starting with only half of the jalapeno pepper. You can always add in more heat by adding the other half of the jalapeno. You can use the same process to get a great Red Salsa. Cheers Tim, hope you find some keeper recipes! Where can I purchase a mortar and pestal? Instead of using a knife to prep for the “smooshing” , do you think using a ninja for a quick chop would take away from the flavor? Hi Ariel! Yeah you could easily use a Ninja or food processor to quickly chop everything up before The Smooshing. 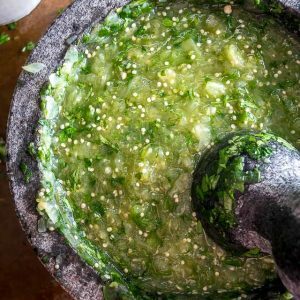 You’ll still get an awesome batch of Salsa Verde and it shouldn’t take away from the flavor at all. Cheers.